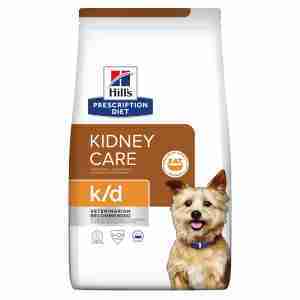 Hill's Prescription Diet Canine k/d is a nutritionally complete feed formulated by vets for dogs suffering from kidney disease. Hill's Prescription Diet Canine k/d has been clinically proven to support your dog's kidney function and slow the progress of disease, giving your pet a better quality of life. The low sodium formulation is easy on the kidneys, while small doses of high-quality protein ensures your dog is getting all the nutrition he needs. The food also includes high levels of antioxidants, which can neutralise free radicals; molecules in your dog's system that can speed up the disease process and deterioration. As a nutritionally complete feed, this dog food is intended to replace regular dog food for the duration of your pet's life. nutritionally complete: takes the place of regular dog food. Signs of kidney disease include increased thirst, needing to urinate more often, weight loss, bad (worse than usual) breath, vomiting, diarrhoea, mouth pain, lethargy, depression and a dull coat. If your dog is showing any of these symptoms it's important to visit your vet right away. Some of the symptoms can be caused by other health issues, so a proper diagnosis is crucial. It's especially important if your dog is aged seven years or older: this is the age when kidney problems become more common. Good nutrition can help to slow the progress of the disease. Protein, phosphorus and salt need to be limited: this means no more human food. High phosphorus foods include doggy favourites like hard cheese, ham, and peanut butter. Because veterinary diets are formulated for the nutritional support of pets with specific clinical conditions, we recommend that you only use them under professional advice. For more information on feeding Hill's Prescription Diet Canine k/d to your dog, please consult your veterinary surgeon. Brewers' rice, animal fat, maize, dried beet pulp, dried whole egg, pea protein, digest, minerals, soybean oil, pea bran meal, fish oil, flaxseed, L-carnitine, vitamins, trace elements and beta-carotene. With a natural antioxidant (mixed tocopherols). Fat 19.3%, fibre (crude) 3.3%, crude ash 4.2%, moisture 8.5%, protein 13.7%. Vitamin A 10923 IU, vitamin C 90 mg, vitamin D 839 IU, vitamin E 600 mg, beta-carotene 1.5 mg, biotin 0.26 mg, calcium 0.59%, carbohydrate 50.9%, folic acid 1.3 mg, L-Carnitine 479 mg, magnesium 0.1%, Omega 3 -fatty acids 1.02%, Omega 6-fatty acids 3.52%, phosphorus 0.22%, potassium 0.69%, pyridoxine 4 mg, riboflavin 7.7 mg, sodium 0.17%, soluble fibre 1.6%, thiamine 4 mg.
Pork liver, maize starch, chicken (5%), animal fat, various sugars, flaxseed, dried beet pulp, digest, minerals, fish oil, cellulose, vitamins and trace elements. Fat 6.6%, fibre crude 0.9%, moisture 74.5%, protein 4.1%. Vitamin A 20719 IU, vitamin B12 2.1 mg, vitamin C 26 mg, vitamin D 215 IU, vitamin E 600 mg, beta-carotene 0.43 mg, biotin 0.15 mg, calcium 0.21%, carbohydrate 12.4%, folic acid 0.34 mg, L-Carnitine 191 mg, magnesium 0.04%, niacin 21 mg, Omega 3 -fatty acids 0.66%, Omega 6-fatty acids 1.04%, phosphorus 0.07%, potassium 0.23%, pyridoxine 3.7 mg, riboflavin 3.3 mg, sodium 0.05%, soluble fibre 0.38%, thiamine 8 mg.
*370 g can is equal to 130 grams of the dry food. This was prescribed by my vet for my 13 year old Labrador. She eats it with no problem and has put on some weight since eating it. I have always kept her at the correct weight but the vet tells me that given her kidney problem it would be good to put a little extra weight on her. The good thing apparently is that she is eating it because even labradors can go off their food. Perhaps it helps that I have a second dog so she knows if she leaves it the other dog will eat it. There has been a marked improvement in her health, long walks are out but she is fine on gentle walks and can be quite sprightly, the main thing is she is happy and can get about easily. There has been a marked improvement in the smell from her breath. In summary, it is great if your dog will eat it. It is so easy to repeat order! I am 14 years old and the vet told me I have to eat this stuff because it's good for me. It tastes awful. My mum puts chicken and rice with it to make it nicer vet said that was OK but I fish out the tasty bits and leave the rest. My mum gets upset because I don't want to eat much and its really expensive. She doesn't mind paying if it's good for me but not if I'm not going to eat it! I'm sure it's good stuff but why can't they make it taste better? I really like the cheap supermarket stuff but apparently it's got all sorts of rubbish in it and too much salt. Miserable dog.